Good Morning! Since it’s a Monday I thought I’d start the week out with a fun story and a reader giveaway. While it’s understandable that to people like us, American’s Double Elite Qualifying Miles offer is big news, and it’s not surprising that on this blog it’s treated as such. At AAdvantage Geek World Headquarters the ‘Double Miles. Double Thanks.’ promo was bigger than the election! It’s a little surprising though when the topic turns up in a news story by a reporter working for a real media outlet. Last week, I was watching the news on local Dallas television station WFAA and one of the stories was about mileage running. Reporter Ron Corning joined up with local Dallas travel blogger, and proud American Airlines AAdvantage Platinum Member, Aaron Kokoruz, for a mileage run. Here’s a story for anyone traveling during the holidays. First class travel for the price of coach may sound too good to be true, but let us introduce you to a North Texas man who says it’s possible for all of us. He took me on my first “mileage run” recently. If you don’t know what that is, or why anyone would want go on one, you’re about to find out. Take a look. Being the AA geek that I am, it was neat to see the AATHX promo mentioned in a story on the local news, it was also cool that the reporter earned enough miles to make AAdvantage Platinum! Go here to watch the story. 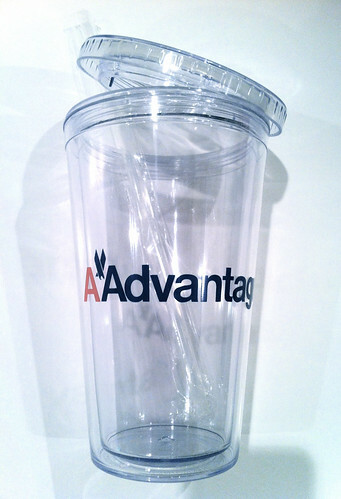 I’m giving away this insulated AAdvantage logo drinking cup in a random drawing. Have you been able to earn any Double Elite Qualifying Miles from this recent American Airlines ‘Double Miles. Double Thanks.’ offer? Just leave an answer in the comments section. I’ll have a random drawing Tuesday morning. The deadline to enter is Monday night, December 10, 2012 at 11:59PM Pacific. One entry per person. Speaking of giveaways, don’t forget that The Frugal Travel Guy’s Monday Deal of the Day is sponsored by AAdvantage. Share your best AAdvantage or American Airlines related travel tip for a chance to win 2,500 AAdvantage Miles! Yes, I’ve earned double EQM’s, including a DFW-LHR turn. In fact, I’m earning today DFW-SFO. Not yet but I’m hoping to squeeze a couple of trips in during the last two weeks of the year – before it expires! Yes! My third and last MR is next weekend. No, I have not been able to earn any miles. Yes I have. I am almost close of making EXP because of the double eqm. Due to work, I’m unable to get away and earn miles. Yes. ORD-LHR, but had made EXP prior to that. Not yet but will on Dec 19th on a trip to the UK!! Yes. On a last minute trip right now. Have a ticket on hold now that should push me to gold. New to all of this so an important first step. No, saving my time/money for just after the New Year to start my 2013 runs. I’ve not yet had the opportunity to take advantage of this. Not yet… hoping to book travel for NYE soon though! I have in the past and hoping to have another one in early Jan or Feb.
Yep. Trip to LHR over the Thanksgiving break. Not a mileage run, but was able to take aadavtange of the double miles on a pre-scheduled trip. I will next week to Miami. I love double miles! Yes, flying SFO-JFK this week! Yep, love the bonus miles! I have not, but only because of a code share stuff up! Nope, I would like to have but we’re traveling by train this xmas. I wish, but didn’t happen. Flying in a few minutes (from JFK) to visit my famility in Buenos Aires! will get PLAT if i’m not wrong! Living in the largest US market not served by AA (GEG), nope. Unfortunatly not! If only they would extend through January! I have not been able to earn any at this point. Yes, flying every week for work. So, they are adding up! Nope… re-qualified for EXP already for next year, and no more travel scheduled.